My first attempt at reeling was not a great success. However, I am going to report what I did anyway. 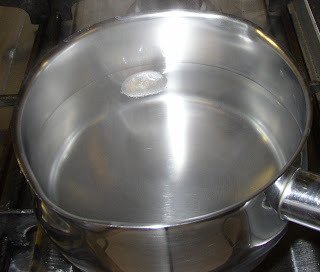 I boiled a little water in a pan, and then turned off the heat. After allowing it to cool for a few seconds I added the semi-opaque cocoon. It floated. 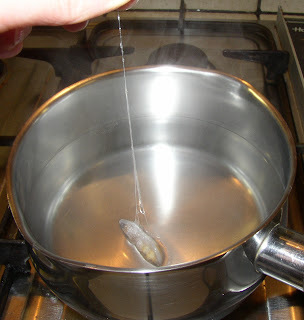 I then stirred the cocoon in the water for a few minutes until it leaked, filled with water and sank. 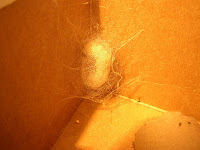 I then noticed that some of the cocoon had come away from the rest. I have discovered that this is because a silkworm silk consists of two proteins - two strands of fibroin which are insoluble (the brin), and sericin which glues the two brin strands together. The sericin glue is water-soluble, and some of this dissolved enough for me to catch some of these fibroin strands on my pencil. Unfortunately, I couldn't get a single thread of silk (a bave = two brin glued together), and resigned myself to pulling away several fibres at once. However, I kept pulling, and found that more and more silk came away from the cocoon until there was only some residual silk left surrounding the pupa. 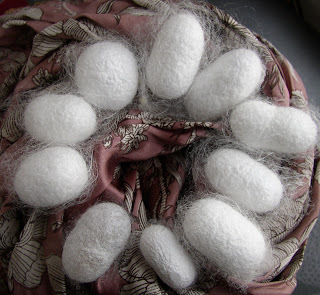 This silk (called the pelade) is slightly different from the rest of the silk in the cocoon and is generally left behind in the reeling process. 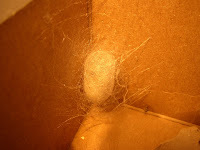 In cross-section, under the microscope, the silk fibres of the palade look flat, whereas silk fibres of the main part of the cocoon have a circular cross-section. The silk of the outer floss is different again, and is elliptical. So the silk I eventually wound around my pencil wasn't a single fibre. It was also of variable thickness and fairly short. I am blaming this on the inferior quality of the cocoon and the lazy nature of the silkworm inside, which obviously couldn't be bothered to finish the thing off. I know this because after I had finished I looked at the 'corpse' inside the cocoon and discovered that it looked like the beginnings of a pupa. Even though I found this slightly disturbing I have to confess that a small part of me also wondered how it would taste like fried in oil. and a little like plucking fruit from a tree, since each cocoon is suspended in place by a web, a 'floss' of silk, which has a slightly different structure from the silk in the cocoon. I have let them nestle awhile in a silk scarf (which seemed appropriate), and it is interesting to see how different they are: one is significantly smaller than the rest, and one is irregularly-shaped, with a waist, and yet another is not quite opaque. Inside I can see the grub. It rattles around, still white, but clearly dead. I am thinking this one might be a good one to try to unravel, or 'reel'. 'Has it occurred to you that no one else is going to be as interested in this, as you are?' Hodmandod Minor says. It is interesting to compare them with a video taken about four hours before, just here. 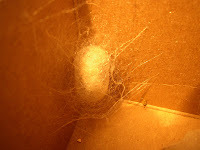 The silkworms seem to construct a messy support web first, and then make smaller and smaller movements until they are enclosed in a cocoon. At the moment, in this video, the one on the egg carton can still rotate, but soon I expect it will not even be able to do that. This must seem mundane and boring to some people, I suppose, but to me it is extraordinary. A Fascinating Competition from Dorling Kindersley! DO YOU HAVE A RARE, INTERESTING, UNSEEN, INSPIRATIONAL OR AMAZING OBJECT; OLD OR NEW WITH A GREAT STORY TO TELL? "We are looking for members of the public to submit unique objects with incredible stories. The winning entry will be published in our new book All This Makes Life Worth Living. This book of wonders, published later this year features a vast array of astonishing items that add something to the world we live in, from Jimi Hendrix's burnt guitar to Edison's lightbulb. "Throughout January we are running a competition for members of the public to be part of this project. Entrants are invited to submit a photograph of their own object and tell us the story behind it. The winning entry will be announced in February and will win a place to be published in the book. 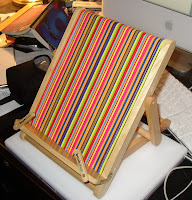 - The object must be available for photography in the UK in March 2009. Already they have eaten their last meal. Soon, whatever they were, will be changed into something else: pupae, and then into mouthless moths. Are they still the same individuals? If we could change from one thing to another - would we still be the same being? Then, after they become moths, they will live only enough days to mate and for the female to lay eggs. Why are they programmed to self-destruct in this way? What if we knew exactly how long we were to live - to the day? As usual, the more I find out, the more I need to find out. Great excitement this morning. When I went to feed my silkworms I found that they were behaving oddly; their food uneaten and they were at the top of their newspaper searching around for somewhere else to climb. This, I remember reading, is an indication that they are on the point of cocooning (although I had also read that they become translucent and more yellow too, which they haven't). So, just in case, I added an egg box, and then some insides of kitchen rolls, but since they climbed up all that I put the whole thing in a bigger box. 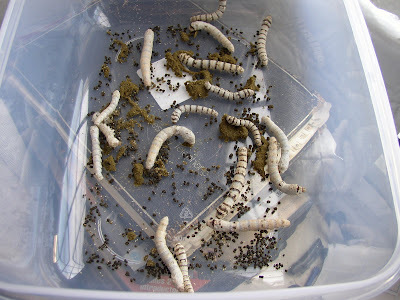 I have also discovered my little camera, which I have had for years, can take short video clips, and, furthermore, I can upload them quite easily to blogger, so here are my silkworms moving...! 1. Is the silkworm moving? If yes, go to 2. If no, go to 3. 2. The silkworm is alive. 3. Has it got its tail in the air? If no, go to 4. If yes, go to 5. 4. Examine the back of the creature. You may see a faint grey line beneath its skin, as if it had a spine. Watch this carefully. Does it pulsate? (This, I believe, is the silkworm's main artery, and evidence that it (i) has blood, and (ii) this is being pumped along its length by some sort of rudimentary heart). If yes, go to 2. If no, go to 6. 5. Watch carefully. Can you see a tiny and perfect little black dropping at the end of its tail? (This will teeter for a second, before being expelled a few millimetres away. If the tray were made from metal it would go ping). If yes, go to 2. If no, go to 6. 6. Give the animal a gentle poke with something clean. Does it move? If yes, go to 2. If not, go to 7. 7. Your silkworm is probably dead. If you bury the corpse at the base of a mulberry bush award yourself green points for recycling. Poor silkworms! I am such a neglectful owner. 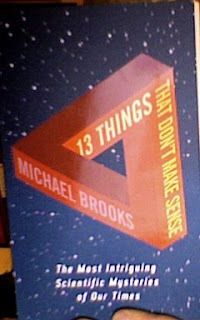 Yesterday I left them in the kitchen waiting to be cleaned out for much more than an hour and it was all because of this book: '13 Things That Don't Make Sense' by Michael Brooks (courtesy of Profile books). Chapter 1 starts with a scene that reminded me of the joke 'How many Nobel physicists does it take...' but '...to open the dodgy door of an elevator?' rather than the usual 'change a lightbulb'. Their struggle lasted for some time - and it turns out to be an excellent metaphor for their dealings with the nature of the universe. To be honest, I tend not to take much notice of the idea of 'the universe' most of the time. When I do, I find it equally enthralling and disturbing. Even so, I have heard of 'dark matter' and 'dark energy' but hadn't really realised until reading this book that they were different ...er... 'things'. I suppose I'd thought of them as massive black holes - but have learnt reading this chapter that they were originally mathematical contrivances (or fudges) thought up by physicists when discoveries (like the universe is expanding at an accelerating rate) didn't quite fit in with accepted theories. What comes over very clearly is how little we all know - even Nobel physicists - and how we will probably never know. Each discovery about the universe seems to cause consternation and ideas to shift or even flip over to become something completely different. As Michael Brooks points out, Thomas Kuhn's ideas on the nature of revolution in science have been vindicated quite neatly in this field of cosmology. Some people, those in the modified Newtonian dynamics (MOND) faction, say that maybe all we need to do is modify Newton's ideas on gravity a bit and that will satisfactorily explain just as much. I like this idea. Then there is another group of physicists that say 'the universe is the way it is because otherwise we wouldn't be able to observe it'. This is the 'anthropic landscape' approach to explaining the nature of the universe - which to me sounds a lot like 'I think therefore I am' - which some chap called René Descartes thought of (with nothing more than a parchment and quill) about 400 years ago. But maybe I'm missing something. No wonder they were having trouble working out how to get into that lift. It must be hard focusing on something practical if you spend all your days thinking about stuff like this. That was all in just the first chapter of this book. It's an entertaining and thought-provoking read and I am looking forward to reading the rest - but next time I start I'll make sure I feed my poor silkworms first. One of the rules of good silkworm hygiene is to remove dead ones as soon as possible. 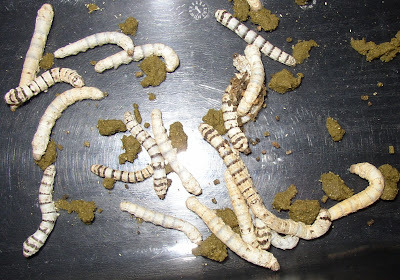 This is because the silkworm is likely to be infected with disease, and a bacterial or viral infection can spread rapidly through the entire progeny. Several of the books I ordered at the library last week have come today: one of them, 'Global Silk Industry' by Rajat K Datta and Mahesh Nanvaty, is a particularly interesting book, but one guaranteed to induce hypochondria -by-proxy in any silkworm farmer. The diseases, which all sound as though they could be describing an interesting French cuisine, are Pebrine, first identified by Louis Pasteur, which almost decimated French sericulture in the nineteenth century, and is spread by spores; Flacherie, a viral infection (symptoms are sluggishness, loss of appetite and vomiting); Grasserie, another viral disease (particularly nasty, the silkworm swells, the skin stretches and becomes yellow and leaks fluid); Muscardine, which is fungal and comes in four varieties (according to which colour it turns the silkie*) - white, yellow, green or brown. The silkworm can also be afflicted with pests: ants, earwigs, wasps, crickets and praying mantis as well as the Uzi fly. 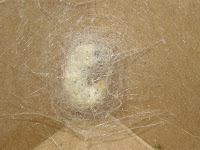 These lay eggs on the silkworm which hatch and leave a black scar. 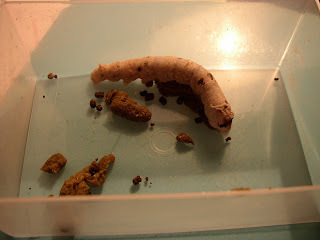 The book provides a picture and when I looked at my silk worms just now I thought one had some of these scars so I have put him in isolation as a precautionary measure (you can see the offending black spot near his tail in the picture below). He looks strong and is feeding well at the moment but I shall be monitoring him carefully over the next few days. 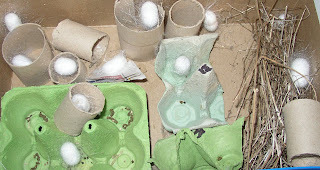 Who says silkworm husbandry isn't exciting? (His name, by the way, is Caradoc). *Thanks to Jem for the terminology. Of Silkworms, Orchids... and Columbian Rebels. Silkworms are fussy creatures. Like Giant Pandas they live only on one type of plant: the white Mulberry Bush (not the black one). If they are fed anything else they sicken and die. Mulberries, in turn, are fairly fussy too: the ground must be well-drained, and they prefer a little warmth. They can be grown in the UK but their season in leaf is short - from May to October. This, more than anything, has dictated the distribution of silk production around the world. The UK, for instance, is generally too damp and cold for effective production, so my pampered creatures are living in our airing cupboard, and they seem to be quite happy in there. Presumably, the silk farm at Lullingstone Castle Silk Farm in Kent kept its silk worms in a similarly cossetted environment. I was excited to come across it on the internet today, and then disappointed to find that it had closed in 2004. It seems to have had an auspicious history - providing silk for three royal weddings, including Princess Diana's in 1981. I remember that gorgeous voluminous dress of ivory silk and now realise it must have taken the cocoons of tens of thousands of silk worms. So, the only British Silk farm has closed, which is sad, but there is something equally interesting in its place. The heir to the Castle, Tom Hart Dyke - the twentieth generation of his family to live there - is a gardener of the most adventurous sort. He has established a garden which has plants from all over the world planted in the outline of the continents. It was, apparently, an idea he thought of when one of his orchid hunting trips went a little wrong and he was kidnapped by rebels in Columbia(!) In the account I was reading it seemed like a remark slipped in by a particularly laconic dinner party guest. 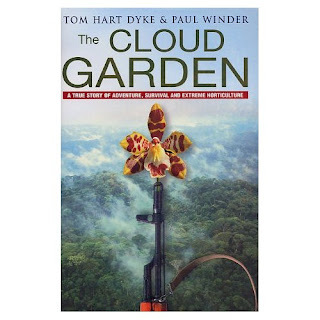 He has written a book about his experiences called THE CLOUD GARDEN - which looks like it would make interesting reading. So, where was I? Ah yes, the vagaries of the domesticated silkworm....more on this later. I have some boxes to clean out. Last February, my father went into a coma for several hours as the result of a stroke. He was not expected to survive and I had to say good-bye to him over the phone. Then, the next morning, as we were on our way to see him, my brother rang me on my mobile. 'He's a little better.' he said. When we arrived at the hospital we were surprised to be shown into the main ward, and even more surprised when a voice called out to us. My father was sitting up in bed - a bit confused but perfectly lucid. Over the next few days he recovered completely. In fact he seemed to me to have more than recovered, he seemed to be more alert and more fluent than he had been before. 'Better than ever.' I'd tell people, but not really believe it, but it really did seem that my father's brain had somehow been rejuvenated by the stroke. Recently I read that this could be true. When the brain is damaged by a stroke there is evidence that stem cells are produced and these differentiate into the types of cells required to repair the damage. The way this might happen is for 'mature' cells (which have long been differentiated into specialised brain cells like neurons) revert back to unspecialised stem cells that can change into anything that is required. A similar discovery was found in insect pupa which was reported in this paper in Nature in August last year. When a larva (like a silkworm) changes into a pupa most of its cells die and inside the shell of the pupa is a sort of 'gloop' with islands of special sorts of cells called imaginal cells. Until last year it was thought that the adult insect (in this case, the moth) is formed from clumps of imaginal cells, which like stem cells can turn into anything that is required. These imaginal cells are inactive in the grub but become activated when the larva is turning into a pupa, and then again when the pupa is turning into the adult insect. However this paper reports that scientists in Stanford (Molly Weaver and Mark Krasnow) have found that it is not just the imaginal cells which turn into the components of the adult insect. In fact other cells - old specialised cells that had survived from the larva - also form part of the adult. They do this by reverting back to a less specialised state and then turn into differently specialised cells in the developing adult. So, by looking at what happens in something as lowly as a silkworm scientists have discovered why exactly my father's brain may have recovered from his stroke. It always amazes me how the most disparate things often turn out to be connected. Silkworms, I have noticed, seem to have two sets of legs: six insect legs on their front segments and then eight, more-rudimentary ones on the segments further back. (Added later: I have since discovered that the legs on the front are thoracic ('real' insect legs) on the thorax; while the ones at the back are prolegs ending in suction caps called crochets. These are on the abdomen). 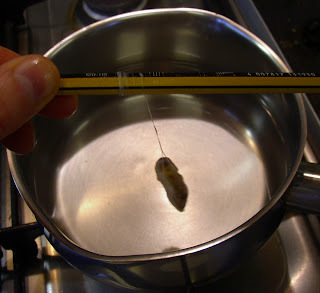 I clean them out every day, removing their tiny black walnut-shaped droppings and the food they haven't deigned to eat. This is to prevent mould, which is dangerous to silkworms. Their food comes in plastic tubs and has the consistency of butter. It is supposed to be grated into their home, but really it is too soft for that. I usually end up with a few small pieces and hope that will do. I think it does, because if I listen carefully I can hear my silkworms eating. It is a contented munching sort of sound - and I think that if I could amplify this it would be quite relaxing. Quite often they stop moving altogether and sit with their heads in the air. They are the texture of a creamy limestone and look so much like statues of themselves that I have been tempted to prod them to make sure they are not dead. However, I have just read on a website that this means they are getting ready to moult. One of them - the small pale one in the centre right of this picture is doing that now. His head seems to have changed a little too - his eyes are protruding and yellow. At least I assume they are eyes. (Added later: these are fake eyes. The real eyes are smaller and below the fake eyes). 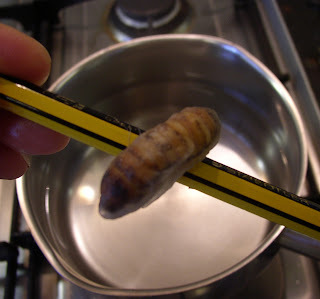 Now a moulting silkworm should not be touched and I feel I am a little like a midwife or an expectant father, wondering what will happen next. I suppose, like all metamorphosing creatures, the silkworm is bristling with stem cells. Somewhere, perhaps on the inner layers of the old skin, there are cells reproducing and becoming something else as they mature and are bombarded with chemical messages: a part of a wrinkle or pigment, grow a bristle or a pore. After a few days a new silk worm will appear - his skin a little tender and vulnerable but otherwise just as perfect as he used to be - part of the series of little miracles which turns the egg into the moth. Unfortunately I was out when they arrived so Hodmandod Minor and Senior had to sort them out (put them in a larger container, grate the White Mulberry Leaves food and warm them up a bit). £550 (Flights & insurance not included - but cheap deals with Ryanair at the moment). * Fully catered with gourmet food and excellent new wines. with local historian Nik Dusern of Spanish civil war location. 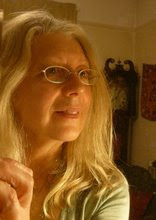 Ann Lingard, who is the originator of SciTalk (a resource for fiction writers to enable them to make contact with working scientists) has just written to me to tell me that she has a novel coming out next week. 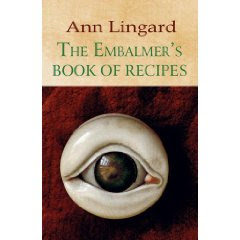 It is called THE EMBALMER'S BOOK OF RECIPES. She has also set up an impressive website to go with the book which has some wonderful imagery and some very interesting information. It's well worth a visit. My 'one-liner' makes the front page of Newsbiscuit! I am leaping around with joy (pathetic, isn't it?). Hermit Research Methods (Sunday Salon). So far I have finished three novels in 2009 so I am very pleased with myself. 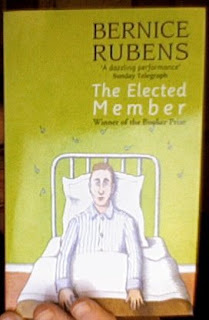 The last one I read was THE ELECTED MEMBER by Bernice Reubens which was an excellent study in paranoia (in particular of silverfish). I have accomplished this through becoming a hermit and not going out. In fact I think I have only been out of the house once since 2009 began, and that was to give Hodmandod Minor a lift to his volunteering 'job'. It felt a little weird to have the open sky above my head for the short walk to the car, and as I started the engine the thought flitted across my mind that maybe I had forgotten how to drive - but luckily it came back to me. On Friday I made the very useful discovery (to a hermit) that my local library does interlibrary loans. I don't know why but I'd always assumed that I'd have to go to the main library in town for this, but no...and furthermore the librarian at this local library agreed to my request that I order my books by email, so I don't even have to go there. Now all I have to do is figure out how to get them to deliver them to my door...perhaps with the groceries, that would be good. When I lie down I hear it. The house is quiet, outside there is a distant rumble of a passing car, but inside my head there are engines humming. They are faint, at the edge of my hearing. I imagine them on tracks, moving forwards a few paces then reversing just to annoy me. Who could be doing this, I used to ask myself. Why bother this late at night? Can you hear it? I ask him. Or maybe it is like the wasps and the blood, the drips of water and the leaking ceiling: just my imagination. I used to be able to tell the difference. I used to know that the little man sitting on my shoulder with the large ugly head wasn't real. When I shut my eyes I can see all these things. I fall into their world and we live alongside each other knowing we have a history - an unreal land of unsorted memories and dreams. It is an unbidden fantasy, a figment of my unconscious mind, nothing to do with the real waking world I inhabit now. But when it is dark it is difficult to tell the difference. 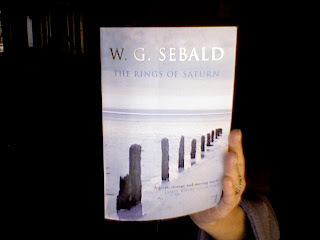 I can't sleep - so I have got up and am reading a little more of WG Sebald's THE RINGS OF SATURN. I'm on the last few pages now, and I have just the same sensations when I read this as I did when I read AUSTERLITZ a couple of years ago. There is a sort of recognition that makes me actually smile. It is there in each paragraph: the walls of the room contracting as they cool; the family that drifts, each member whimsically existing without purpose; even the empty fields and the tendency of certain characters to shut themselves away from the world. At the end of it I couldn't really tell you what I've read. It's as though I've spread a patchwork quilt over my head and I am reading a story from each square of fabric. Sometimes the squares and the stories are incomplete, but it doesn't matter at all. All that matters is that I read, and the patterns and the stories intertwine, and will make exactly as much sense as my life; as anyone's life. Recently I received an email from a reader thanking me for my 'wonderful' book; apparently many images had stuck with her, and as if had been six months since she'd read it she thought this a good sign. 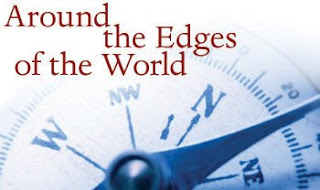 She then went on to say she had been recommended my book by a friend after she had read and praised two other books about Arctic exploration (details supplied), as well as her blog address. Of course I took a look and clicked through from her blog to take a look at her review of my book and the two others she had mentioned on the website 'Goodreads'. These she had awarded five stars and fulsome praise; while mine she felt warranted not as many and furthermore gave a few masterful tips on where exactly it was deficient. 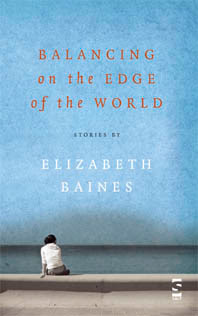 Such a good thing she is writing a novel herself about a geologist - I do hope she makes a better job of it than I did. While flicking through the same website this morning I notice that my other book has been labelled a 'truly terrible read'. This other reader doesn't say why she found it a 'truly terrible read' but when I see to what else she has awarded one star - books I happen to have much enjoyed - I feel oddly complimented and run downstairs to tell Hodmandod Senior in faux delight. I console myself that perhaps it is better to have a strong effect than no effect at all. I joined 'Goodreads' several months ago and so far have visited the site just to see what's there, but this morning my finger hovers over the button that would invite one of these reviewers to be my friend. Even now feel tempted to click it. Tomorrow is the last day left to vote for the short list of World Book Day. 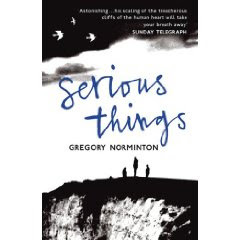 This is a vote for books that 'stimulate thought and debate' and Gregory Norminton's book, SERIOUS THINGS, is one of the contenders on the long list (you can vote here). SERIOUS THINGS is thought-provoking in many ways: not only does it deal with the haunting effect of guilt of a specific wilful action, but also the 'guilt' of us all in our inadequate response to the threat of climate change. Anyway, best of luck to Gregory - SERIOUS THINGS, as I said yesterday, is a book I much admire and would make a worthy winner.